[SatNews] On December 5, 2014, the global space community watched as the Orion Multi-Purpose Crew Vehicle (MPCV) was launched aboard a Delta IV Heavy rocket from Kennedy Space Center. After a two-orbit, four-hour flight that took it further from Earth than any other human-rated spacecraft since Apollo 17 in 1972, it returned safely to a splashdown in the Pacific Ocean near California. 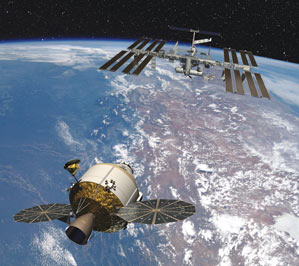 An artist’s rendering of the Orion exploration vehicle approaching the International Space Station. In his congratulations to NASA, Lockheed Martin, United Launch Alliance and the entire industry-government team involved with this successful first experimental test flight, Space Foundation Chief Executive Officer Elliot Pulham said, "The world is once again on a firm course of space exploration that will get us out of low Earth orbit, taking humans back to the Moon and on to Mars and beyond. As an early pathfinder for the Orion program, EFT-1 represents a gutsy effort by the entire Orion team to test early, test often and get ahead of the substantial risk involved with any new human rated system." The Space Foundation will honor the NASA/Industry EFT-1 Team for its historic accomplishment with the 2015 Douglas S. Morrow Public Outreach Award, to be presented on April 13 during the opening ceremony of the Space Foundation's 31st Space Symposium, co-sponsored by Northrop Grumman, and held at The Broadmoor in Colorado Springs, Colorado, USA.